RIO DE JANEIRO - The boy who left home at age 14 to train in the United States, in pursuit of a dream many labelled impossible, is now the man who has delivered his nation's first Olympic gold. Joseph Schooling's single-minded, seven-year chase of his Olympic dream bore fruit when he touched home first in the 100m butterfly on Friday night in Brazil (Saturday morning at 9.12am, Singapore time, Aug 13), showing the world - and his countrymen back home - what a small country like Singapore is capable of at sport's pinnacle. 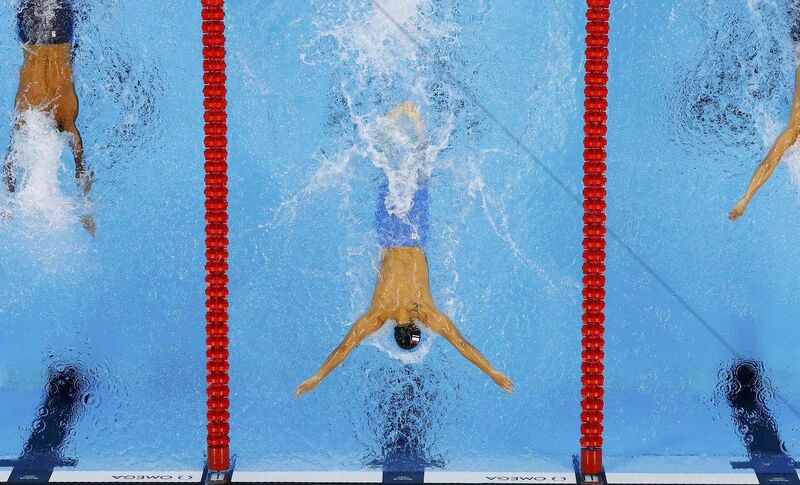 In an Olympic-record time of 50.39sec, Schooling eclipsed the 50.83sec he clocked just the night before in the semi-finals to qualify fastest for the final. In that same time, he became the Republic's first male Olympic medallist in 56 years. Tan Howe Liang's weightlifting silver in 1960 was the last and until now, the only won by a male athlete. In that same time, he added a shiny gold to Singapore's modest medal tally. It now stands at one gold, two silver, two bronzes over almost seven decades of participation at the Olympics. In an astonishing three-way tie for silver, defending champion Michael Phelps of the United States, five-time Olympic medallist Laszlo Cseh of Hungary and defending world champion Chad le Clos of South Africa all clocked 51.14sec to share second place. 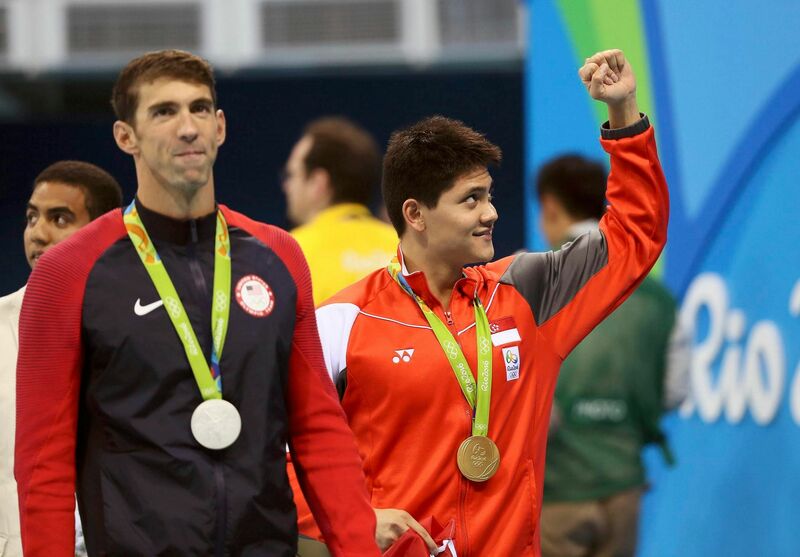 Straight after his historic golden feat, Schooling told Singapore media: "This swim wasn't for me. It's for my country. "Some people believe that Singapore has a lot of talent. I believe that. It doesn't matter where you're from really. I hope this opens new doors for sports in our country and I hope I've set a precedent for the young in our country. "It's been a hard road, I've done something that no one in our country has done before. I've received a lot of support and that's phenomenal, that's great. I can't really describe what that means. "But it's been a tough road, I'm not going to lie, the first guy through the wall is always bloody. I had to take that blow. "I'm thankful and I'm blessed that I have the ability to accomplish this. This moment is not about me, it's really for my country, it's all about my coaches, my family, my friends who believed from when I was a six-year-old kid, that I could do it." Competing against multiple Olympic champions and world champions like these, what Schooling was tasked with on Friday felt unthinkable before the race, despite the cool and confidence he has shown in Rio. It seemed incredible to think that a 21-year-old from Singapore, a country that before Thursday never even had a male swimmer in an Olympic final, stood a chance against the greatest Olympian of all time. Case in point: some among the American media, while full of praise for Schooling's quality, coined the term "The King and the Kid" to describe the American great and the challenger who grew up emulating Phelps. But there was surely no doubting the Singaporean's steely nerves tonight. It takes substance and guts - audacity, even - to beat Phelps in an event he is a three-time Olympic champion and world record holder of. And to be the man to hand Phelps his first defeat after five finals at the Olympic Aquatics Stadium. But that is now moot, for naysayers have been silenced, Schooling's years of toil rewarded and prayers from Rio to Singapore answered. As Schooling said to the gathered Singapore media group: "I'm full of emotions right now, I don't know what to believe, whether I actually did it or whether I'm still preparing for the race. "I need to let this moment sink in. Right now all I can say is, I'm really honoured and privileged to have the opportunity to race in the Olympic final alongside huge names like Michael (Phelps), Chad (le Clos), Laszlo (Cseh), guys that have changed the face of this sport." "Nobody is happy to lose, but I'm proud of Jo. What he's able to achieve is up to him. Ball's in his court. As big as he wants to dream." Asked what Phelps said to him after the race, Schooling told the Singapore media: "Good job, that was a great race, he said. I told him to go four more years and he said 'no way'. Hopefully he changes his mind. I like racing him." President Tony Tan Keng Yam, Minister for Social and Family Development and president of Singapore National Olympic Council Tan Chuan-Jin as well as Minister for Culture, Community and Youth Grace Fu were there to witness history made. Singapore now has one Olympic gold. Just one, but one that is so precious. For the first time, Majulah Singapura has rung at the Olympic Games. And it is a sweet, sweet sound.